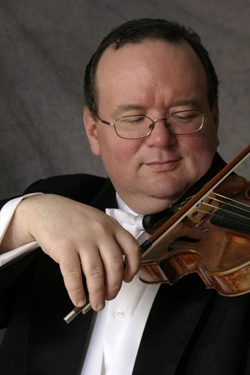 for its upcoming concert, which features renowned guest artist, Brennan Sweet, the Associate Concertmaster of the New Jersey Symphony Orchestra. Bring your instrument, bring your friends, and get a chance to play with a renowned violinist while having fun! NJIO is always excited to welcome newcomers to this orchestra that celebrates playing instruments together, no matter what your age or playing ability. 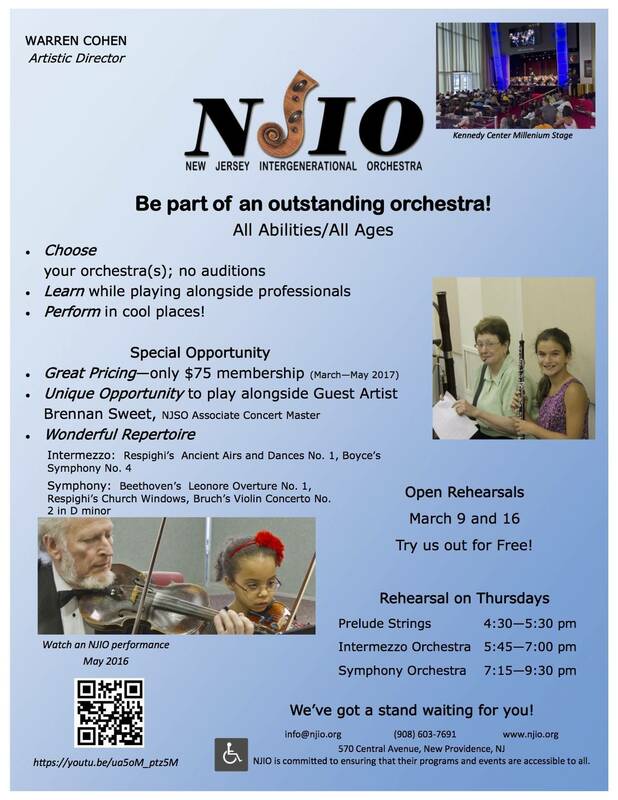 Whether you are a musician looking for an excellent non-competitive orchestra to join or an avid classical music lover seeking free concerts, NJIO invites you to learn more about this organization based in New Providence. It’s the start of a new concert period and the music is new to everyone. Come get the feel of the orchestra and see why the musicians love being a part of the NJIO family! Light refreshments will be provided. Prelude, an ensemble intended for beginning strings, rehearses 4:30-5:30. Intermezzo, an intermediate-level group that recently expanded to a full symphony orchestra (strings, winds, brass, and percussion), rehearses from 5:45-7 and Symphony, the more advanced symphony orchestra, rehearses from 7:15-9:30. The Open House rehearsals offer a chance to try out NJIO and see if it is the right orchestra for you. You also get the opportunity to play through the music for the upcoming “Grand Gestures” May concert (concert details below). NJIO is offering a special spring registration for only $75, which includes seven rehearsals, including a sectional rehearsal for in-depth attention from your section leader. At NJIO’s spring concert, Symphony Orchestra, conducted by Artistic Director Maestro Warren Cohen, will be performing Beethoven’s Leonore Overture No. 1, Respighi’s Church Windows, and Bruch’s Violin Concerto No. 2 in D minor, featuring soloist Brennan Sweet. NJIO’s Intermezzo Orchestra, led by Brian McGowan, will also perform a Respighi piece, Ancient Airs and Dances No. 1, as well as Boyce’s Symphony No. 4. Be sure to arrive to the concert half an hour early to enjoy a short, but delightful serenade by NJIO’s Prelude Ensemble, led by conductor Robert Anderson, in the lobby. During Intermission, NJIO’s newly formed Flute Choir will perform selections. WHEN: May 7, 2017 at 3:00 p.m.
NJIO is committed to ensuring that its programs and concerts are accessible to all. For more information regarding the organization, the concert or to inquire about patron services, please contact Administrator Mary Beth Sweet at (908) 603-7691, info@njio.org, or visit NJIO’s website http://njio.org or Facebook page. IMAGE: Brennan Sweet, Assistant Concertmaster of the NJIO and guest soloist at the Spring concert.